Out-Spokin-Wheelmen is Youngstown, Ohio"s recreational cycling club that has been active for over 30 years. Our 300+ membership includes bicyclists from all over Northeast Ohio and Western Pennsylvania. 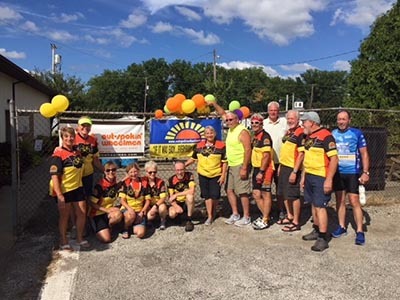 Becoming a member of the Youngstown Area's largest bicycling club is a great way to meet new people, as well as maintain a healthy lifestyle. During the bicycling season, individual club members plan and lead a variety of rides, varying in distance, speed, location and terrain to accommodate everyone's skill level. While cycling is our main focus, we also do hiking and cross country skiing. In addition, members get together for a monthly dinner night out. No matter what your skill level, join us at our next ride or meeting! Please contact us for more information. Youngstown is located in North East Ohio near the area where the glaciers stopped their forward movement. This geologically significant event provides the area with flat to rolling terrain North and West of Youngstown while South and East tends toward rolling to hilly terrain. The area is blessed with many fine parks, bike pathways, and rural roadways allowing the cyclist to enjoy the out of doors. The Erie to Ohio Rails to Trails pathway will soon be completed through the Youngstown area which will eventually offer more than 150 miles of pathway from Lake Erie to the Ohio River with jumping off points to other parts of the state. The Club sponsors two invitational rides each year. SICCO (Spring In Columbiana County Ohio) is held the first weekend of Spring each year to kick off the cycling season in the area. NEOC (North East Ohio "Cookie" Century) is held in September of each year and provides ride routes of 25, 50, 62, and 100 miles through beautiful countryside north of Youngstown. The 25 mile Greenway Path option avoids most traffic and is perfect for a new rider at NEOC. The ride schedule includes rides around Mosquito Lake, through Mill Creek Park and other areas during the riding season. Weekend rides of various destinations, speeds, and terrain are lead voluntarily by Club members. In addition to recreational rides, the club's activities also include mountain bike rides, hiking, cross-country skiing, skating, and sledding . The club operates throughout the year. Check the schedule for this month's activities. The OSW endorses safe riding practices in its rides and urges all participants to read and understand the Rules of the Road and to wear helmets. The club encourages others to become interested in cycling as a fun, healthful, safe sport. Membership in the OSW Club has, among other benefits, monthly newsletters detailing many of the rides, member rosters, and other information to enable you to enjoy outdoor activities in the Youngstown area.